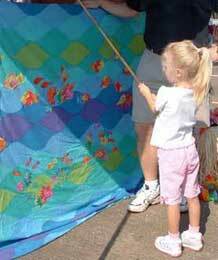 Watch as I go undercover as a festival volunteer, manning the mysterious children’s game called “The Fishing Pond.” What really goes on behind that curtain? Let’s find out. I was actually quite excited to be assigned to the Fishing Pond. For those of you who aren’t familiar with it, it’s the game of choice if your kid is uncoordinated, lazy or uncompetitive. That’s because it requires no skill. For a mere 25-cent ticket, a kid takes a makeshift fishing pole with a clothespin instead of a hook. The line is then “cast” over a curtained booth where someone behind the curtain attaches a prize. Easiest game ever. In my opinion, the ideal way to operate the fishing pond is to create some sort of mystique around it. The younger kids are supposed to wonder how the hell this little baggy full of assorted crap treasures got put on their hook. Plus the prize should be suitable for their age and gender. In order to make this happen, it requires a little cooperation between the curtain person and the ticket taker. The ticket taker should subtly ask how old the kid is, and then offhandedly repeat that information loud enough so the curtain person can hear it and pick an appropriate prize. Apparently the first lady I worked with didn’t get the “mystique” memo. “It’s a girl, age five!” she’d yelp to me as I stared at her incredulously. So much for the mystique factor. The next thing you need to know is that working the fishing pond can be very dangerous. The kids doing the fishing have no concept of where they are pointing the long pole; all they care about is getting that loot off the clothespin as fast as possible. Time is of the essence when you have a tiny slide puzzle or some shiny new stickers in front of you. On the other hand, sitting inside the fishing pond is not much safer. The kids who can actually cast the line end up whipping it over the curtain and clunking me on the head. At the very least protective glasses should be issued. I had two parents actually play the fishing pond game themselves. I couldn’t really stop them, I guess. I suspected it was a guise to get more loot for their kids, which is pretty ridiculous. “Uh…woman, age 42!” I chirped to my accomplice behind the curtain. Sorry, lady, but if you are going to play this children’s game then you get your age announced just like everybody else. Oddly enough, the parents who played were a husband and wife who sported matching tee shirts that said “I Love My Church”. What the hell are they teaching you at this church, people?! Then there are the parents who are just blatantly greedy. These would be the ones who come through with their six-month-old babies. They know perfectly well that I am not going to give them any of the “normal” prizes, most of which feature small choking hazards. And then there are other prizes that just wouldn’t make sense for a baby, such as notebook and pencil set. (However, it would have been pretty darn funny to give them that, just to prove a point. Note to self for next time.) Nope, they came through that line with a baby because they knew we were giving out stuffed animals. Have they no shame? Okay fine, it’s her birthday, I said to myself. I’ll give her something good. I attached a primo stuffed animal. Seriously? After I clearly gave you one of the best prizes, you are going to come back to the pond for more? First of all Grandma, I’m pretty sure you would demand the frog whether or not it was her birthday. And secondly, does she think that I have some sort of computerized inventory back here? And what are the chances I’d have a frog? These are donated prizes. You’re lucky your granddaughter isn’t getting one of the misprinted pencils that say “Zelda and Goran, September 10, 2010”. I managed to found a little stuffed turtle. Thankfully Grandma seemed quite happy with the result, or at least she pretended to be so that the little girl would not be too disappointed with the wrong amphibian. My one disappointed customer was instead a six-year-old boy. I heard him shriek, “Are you kidding me? !” when I gave him Shrek ears on a headband. I thought they were funny, but he was clearly not amused. Toward the end of the festival, we started running low on prizes – or at least those prizes that would fit on a clothespin. At that point we would pin a package of Starbursts to the pole but then the pond would “spew” about 5 more pieces of candy. “Wow, those fish are really feisty,” I would explain. Let that be a lesson: get to the fishing pond early while the gettin’s good. So those are all of the mystery details behind the Fishing Pond game. Next time perhaps I will learn the secrets of the ring toss.